Subject:"How to Tell Whether You Need A Questar"
Questar advertisement of January 1956. 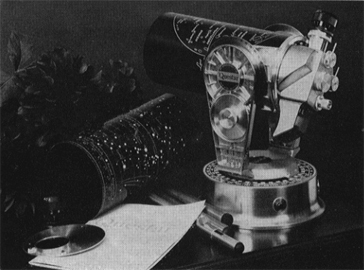 The 1950's Questar logo (above), telescope photo and captions were added by Company Seven. If your telescope is too much trouble to set up and take down - you need the always-ready Questar. If you can't take it with you everywhere - you need the truly portable Questar. If you live in an apartment - you need the window-sill-size Questar. If your wife is saying "Get that contraption out of here!" - you need the easy-storing Questar. If you are tired of refractors' rainbows - you need the color-free Questar. If your reflector is always out of adjustment - you need the permanently aligned Questar. If your solar device warps your optics and cooks your eyepieces - you need the external-solar-filter Questar. if you want the utmost in fine resolution, with which to tackle Dawes' limit and indifferent air - you need the wonderful catadioptric Questar. If your finder is hard to reach - you need the built-in-finder Questar. If you haven't a built-in negative achromat - you need the finger-flickamplifier Questar. If you haven't an equatorial telescope with circles, clamp and smooth slow motions - you need the elegantly mounted Questar. If you haven't automatic following - you need the smooth, electric Questar. * * * If you've finally had about enough of instruments with long shaky tubes - you need the short, rock-steady Questar. And if you just plain get a crick in the neck-you need the restful-posture Questar. The incomparable Questar is many instruments in one. It is a fine telescope for serious work, whose new kind of observing comfort encourages achievement. It is a lifetime of entertainment and enjoyment for your family, your friends and yourself. Questar comes complete with all accessories in an imported handmade English leather case at only $995. Your check for $300 will reserve an instrument.. Questar is shipped prepaid and fully insured in the continental United States. It travels in a reusable steel and fibre "Leverpak" drum, floated in resilient preformed hair and latex pad. ding. Booklet available on request. Questar's performance as a telephoto lens is being evaluated by an independent agency. The first experimental work has already produced exciting results. In the near future we will bring you the whole story, with its startling significance for the photographer.